I understand! Kiwanda is state land, so it can't be reserved for an event. I think that in 2012, the involvement of Ken and Dave made a big difference in the meet being respected by all pilots. At present, peer pressure is all we could really on, and the NW pg community has demonstrated their selfish propensity to over run a site on a whim if conditions are good. Our local Examiner in Auburn, has repeatedly and intentionally misrepresented me and my motivation to preserve our sport to the entire pilot community, in the most negative and insulting manner he can. It is a vicious atmosphere of unnecessary conflict that he has personally fabricated here in Seattle that causes my doubts that we would be respected, without the calming involvement of a person like Ken or Dave. This is why I feel that my posting this event to CBCC is a bad idea. My private correspondence with hang glider pilots from this area supports these concerns BIG TIME. Some have been driven out of their historic clubs. It speaks to my lack of enthusiasm about the Cape meet. We are a rogue organization seeking to reclaim American hang gliding from yahoo parachutists. Public announcements of our plans may not end well. if you are willing to wear a parachute rather than fly one. DaveSchy wrote: ... the NW pg community has demonstrated their selfish propensity to over run a site on a whim if conditions are good. 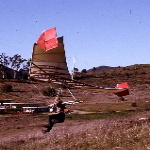 Rick Masters wrote: Some [hang glider pilots] have been driven out of their historic clubs. Dave, the US Hawks welcomes existing clubs and we also facilitate the formation of new clubs. USHPA requires 5 people to start a club. We only require one. You folks are so tenacious and fortunate to have accomplished what you have at Dockweiler. You have it available 4-5 times a month, with no USHPA, no PG, just fun and fairly predictable winds. If we don't meet at Kiwanda, I will come there this winter! It makes me sad that my being a voice for the Hawks, here in Seattle, has created such a vitriolic retaliation from local KoolAid drinkers. I have been labeled a traitor (and worse) just for trying to explain how far USHPA has taken the sport I love away from its roots. These people have a binary world view that is totally fabricated and inflexible. Theirs is Jingoism at its worst, and this is why I fear a sneaky and rotten retaliation against any official local Hawk presence or event. I will do what I can on a grass roots level, and I am condisering taking a sabbatical from USHPA after 42 years, for some personal reasons, and in part because I can not agree with their financial irresponsibility, politics, and politicians that affect our local flying sites. I suggest that others may consider doing the same as a means of "voting with our wallets". We'll see how far USHPA membership can plummet and remain financially viable..... One has 3 years to be reinstated with full ratings and special skills, without any testing, or other bs (according to current rules). One might get a "new" membership #. At this point, it seems uncertain that USHPA will even be able to remain financially viable 3 years from now, at the rate they are presently losing members. There are two kinds of clubs - those that will work to satisfy the needs of all their members and those that won't. The Rio Grande Soaring Association (RGSA) is of the first type. Some of the long time hang gliding pilots were not happy with USHPA and quit. But that caused a local problem because their club bylaws required 100% USHPA membership. Their club has a strong PG sector which might have said "tough ... get lost", but they didn't. Several of us (Frank, Bill, Mike, and I) brought the problem to the club with a reasonable proposal, and everyone cooperated. It was great to witness, and the club is still together. Contrast that with the San Diego Hang Gliding and Paragliding Association (SDHGPA). Several of us brought problems with representation to the club and their President (David Metzgar) told us to literally get lost. That was the start of the Torrey Hawks which eventually led to the U.S. Hawks. The key word there is "necessary". The SDHGPA made the separation necessary, but the RGSA did not. The Declaration of Independence goes on to list the reasons compelling the separation in great detail. It also refers to the attempts at resolution that were denied. That put the revolution on solid ground. I recommend making your case to your local club that they follow the RGSA model to keep the club together and not make separation necessary. If they are not willing to do that, then you're justified in forming a new club. I think some of the other members will recognize the injustice and join you. And others, of course, will not. That's as it should be because you don't want those others in your club anyway. It's nice how that works out. By the way, if I come up to visit, I'd be happy to meet with any of your club members (on either side) to talk these things through and share my experience (good and bad) in starting new clubs. Maybe we could gather for lunch or dinner a few times. The suggestion of a Cape Kiwanda reunion of vintage HG pilots was a non-starter, so it is "dust" now. There is no longer any effort on my part (or anyone else's that I know of) to have a flying meet event, of any kind, at Cape Kiwanda in early May. However, as an individual hang glider pilot, not representing any thing or anybody else, who after many years of not flying, had a very short flight at Kiwanda in May 2012, at Oregon's "40th Anniversary of Hang Gliding" meet, in my Eipper "standard" rogallo. I have dreamed of flying there again after I started flying regularly at Dockweiler Beach and acquired an Alpha 210, a Condor 330 and a Condor 225 (the Alpha now belongs to Joe Faust). So, to make that dream come true, I have rented a cabin in Pacific City for early May and I'm driving up to spend a week living that dream. I look forward to meeting the local pilots and sharing flying and sharing some beers when the days are done. It would be great if some of my fellow SoCal pilots came along, but I only know of one "on board" at this time. But that's one more than in 2012! Please post this to other forums. That's Joe Faust's number ... twice. US Hawks doesn't actually have member numbers, am I right? Oh - and neither does FDGS, but as founding president I awarded myself numero uno. Frank Colver wrote: Thanks Bob! Technically they're really member dates (the sign up date), but those dates create an ordering that can be numbered. The tricky part is that we've had a number of fraudulent sign ups (spammers etc) that don't deserve to waste our member numbers. When a new "member" registers on the forum, I send them an email message asking about their interest in hang gliding. They don't become a real member (on that list) until they respond. It's tricky because there's no explicit time limit for them to respond. So someone who registered 6 months ago, but didn't respond until today would be entered into the list with the date of their registration. That would "bump" the numbers of those who registered in the 6 months since then. We could revise this policy, but it's been easy for me because the forum automatically keeps track of the registration date. So there's no question about it. Please take a look at that registration/membership list when you get a chance. Also, in addition to that official list (maintained by hand), the forum has a "Members" button at the top. That will show all registrations (confirmed or not). It has a nice feature that lets you sort it by various columns (ascending or descending). I enjoy sorting by number of posts with most active at the top. It's inspiring to see how many people have made major contributions to our forum. I was unaware of that number system, thanks Bob. Too bad i didn't know about US Hawks in time to continue my member #7 streak.